With rising applicant numbers and a clear relationship between graduate schemes and organisational performance, the role of the graduate recruiter is increasingly viewed as business critical. So how do you ensure that only the most suitable, able and motivated candidates are selected? A well-structured assessment programme will help employers build an employer brand. Candidates who participate in an engaging and professional assessment programme which genuinely reflects the job and the organisation are often impressed by that company, even if they are rejected. Getfeedback can provide the support and tools required to deliver a professional, accurate and engaging assessment process to ensure that you get the best candidates for your scheme. The first stage of any graduate recruitment process is to ensure that you know what it is that you are looking for. Many organisations use role profiles which can be subjective and difficult to measure against. 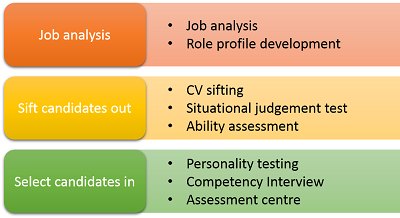 An accurate role profile with a clear map of the skills, ability levels, personality map and competency levels provides a framework against which candidates can be assessed to ensure that they have what is needed to be successful in role and that they will fit the culture of the organisation. Getfeedback’s consulting team can work with you to create a valid, accurate and realistic role profile which candidates can be easily compared against for competency, skill, ability and personality fit. With an average of 83 candidates applying for each graduate job, sifting candidates can be a difficult and time consuming process. Getfeedback can provide a range of online assessment solutions to help find the candidates that have the skills and abilities required and reduce applications to a manageable shortlist. Getfeedback’s online assessment platform also easily integrates into applicant tracking systems and is already linked to many of the market leading solutions. Situational judgement tests measure the way an individual is likely to react to certain situations. Candidates are asked to rate the appropriateness of possible responses in relevant work based scenarios. By using scenarios that provide an accurate reflection of the role and the organisation these tools provide candidates with a realistic preview of the job and can help candidates sift themselves out and reduce the applicant pool. Getfeedback’s Situational Judgment Tests are designed for numerous roles and industries and can be tailored for your specific needs where required. Ability assessments objectively measure candidate’s verbal, numerical, critical, or logical reasoning ability. These assessments have been developed to be secure, reliable and accurate predictors of performance. Designed for remote assessment, our ability tests have built in safeguards to ensure that the results can be trusted and verified. Getfeedback provide access to assessments designed for a range of levels and abilities and can ensure that the most appropriate skills for the role are measured to ensure that your shortlisted candidates have the right skills and abilities. Once you have sifted out the candidates that are not right for your organisation, it’s time to select in the candidates which are. Getfeedback’s personality, motivation and behaviour/competency measurement services can help you to identify the graduates that will provide the best fit from your shortlist. Personality and motivation assessments allow you to measure the shortlisted candidates fit for the role and culture of the organisation. They provide data on a candidates personal preferences in how they like to operate along with aspects of the role they will need in order to be engaged and productive. These can traits can be measured against the role profile to identify the candidates that will fit the requirements of the role. Getfeedback provide a wide range of personality measures and will help you to decide on the best tool for your needs. Once you have decided on the role we will map your requirements to the instrument to highlight areas where candidates meet the profile and areas which may need to be explored. Behavioural Event Interviewing (an advanced form of structured interviewing) gathers evidence of past behaviour against a competency or behavioural framework. By asking someone to describe a past experience the interviewer is able to identify the behaviours that the applicant has demonstrated in the past rather than what they say they would demonstrate during a traditional competency based interview. This evidence can then be matched against the competency requirements of the role profile to assess fitness for role. Getfeedback consultants use the Schroder High Performance Framework to measure candidates against. Alternatively where companies have robust frameworks in place already, we can tailor the BEI to use an organisation’s own framework. Assessment centres provide an all-round assessment of an applicant’s suitability for a role. They allow for direct sight of an individual’s skills, personality and behavioural traits in action to see how an individual will operate in a real situation. This allows for more accurate differentiation of high quality candidates who may seem similar on paper. A well designed and organised assessment centre delivered by assessment experts is the most accurate way of measuring an individual’s suitability and potential future performance. Getfeedback can provide off the shelf assessment centres with robust, tried and tested business simulations, designed to measure a variety of competencies, behaviours and skills. Our business simulations have been devised using real life business issues to provide rich background information upon which candidates can make decisions, solve problems and demonstrate their ability to get the best from others. Alternately we can create a bespoke event tailored to your own business, culture and industry where we design business simulations specifically aligned to what the successful candidate will be asked to do in the role. We can provide a flexible and adapted approach: from setting up and running assessment centres on your behalf to training you to run your own centres, or auditing your existing processes. To discuss your requirements or how Getfeedback can help you assess your graduate applicants call us on 01491 845 536 or email us at info@getfeedback.net.